Myrtle, like her littermate, Harmony, was purchased as a four year old, having never been bred. We bred them both, and thoroughly enjoyed seeing the outcome! 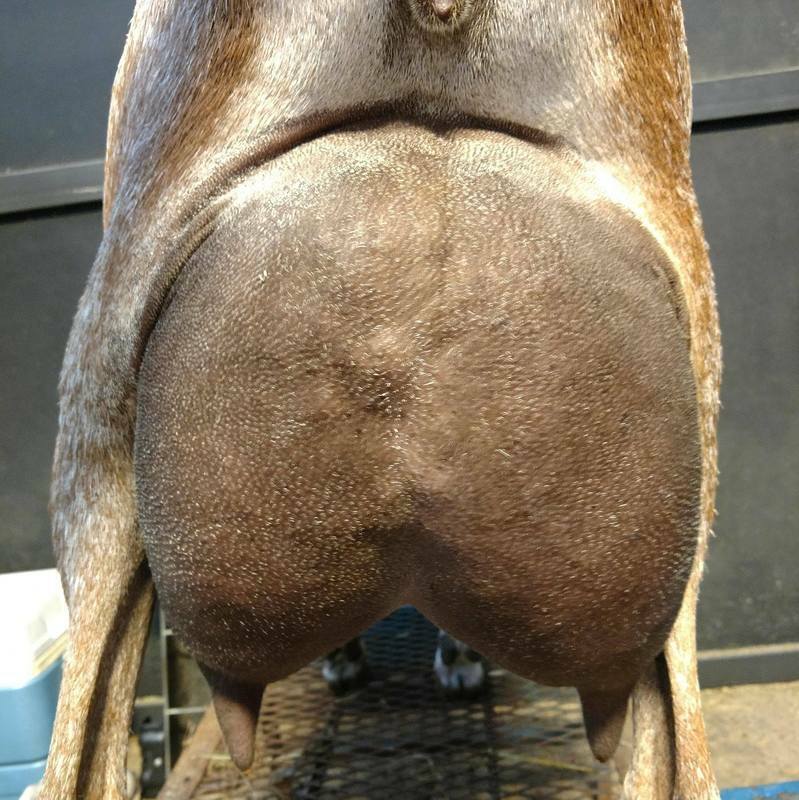 Myrtle, like her sister has an extremely high, wide, and well attached udder! 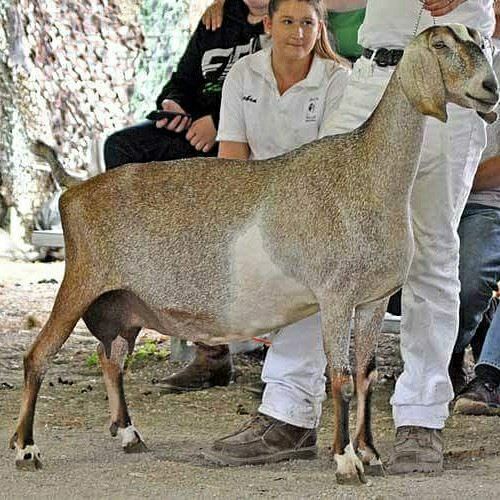 She has taken the spotlight at the 2015 shows as her sister had to sit most the year out, and has finished her championship within the first 2 shows out. 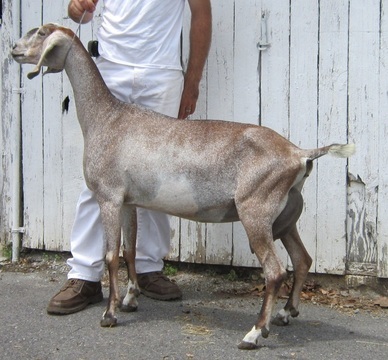 as a 7 year old, 3rd freshener, Myrtle bas BOB twice at the first show out, where her 2016 doe kid, Silver Belle as an intermediate kid took Reserve Junior Champion in ring 1, and Junior Champion in ring two, earning her dry leg over some lovely animals from well respected herds. 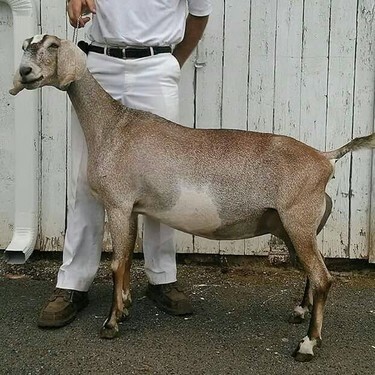 Myrtle's daughter, SGCH Song, has continued to impress us being first in all her age group classes in 2016, then going on to place 2nd place, 2nd udder yearling milker at the 2016 National show. 2016 is our first season being on milk test, and Myrtle has been consistently milking over 14 pounds a day, even on test. She got deathly sick at 2016 Nationals, and was unable to show, but we are grateful she pulled through! Just weeks after her illness at nationals, Myrtle went to the New Jersey State Fair, and in strong competition she was BOB in both rings. Myrtle is a hard working doe both in the milk pail and in the kid pen. She impressed us in spring 2017 producing quintuplets, 4 does and a buck! We retained two of these doelings, Ambition & Beauty, and are looking forward to seeing them kid spring 2018. After having quintuplets spring 2017, at the first show our, Myrtle won BIS over an impressive crowd at the New Jersey Spring Bash!! Myrtle has been tested for G6S and is normal. We are so pleased with how Myrtle has matured, produced, and even earned her 92EEEE appraisal score!